In our last article, we reported the astonishing statistic that 48% of businesses in the UK intend to provide their customers with a dedicated mobile website by the end of 2013. This is in direct response to the meteoric rise in popularity of smartphones and tablets, of which there were an estimated 7billion worldwide at the end of last year. Standard e-commerce websites, when viewed on a smartphone or tablet, can be difficult to navigate. Particularly on a smaller screen such as that of the iPhone, graphics and text can be too small to see properly without frustrating panning and zooming whilst formatting that looks perfect on a computer screen can appear wildly distorted. Niggling problems such as these will quite often cause a visitor to look elsewhere for a website that is more compatible with their device, thus losing the business valuable custom. As the number of smartphone and tablet users continues to grow, all e-commerce businesses need to provide attractive, optimised mobile websites to their customers in order to remain strong as m-commerce systems become commonplace and expected as standard. Twistfix are an online supplier of damp proofing and masonry crack repair products to the construction, repair and renovation industries, as well as DIY-enthusiasts. Trusted by a network of thousands of registered contractors and with a reputation for supplying products of superlative quality, Twistfix also feature a selection of free, informative how-to videos on their site. The website, which recently enjoyed a comprehensive upgrade, is one of Brickweb's many success stories and the company have recently decided to move into the growing world of m-commerce by asking us to design their brand new mobile website. 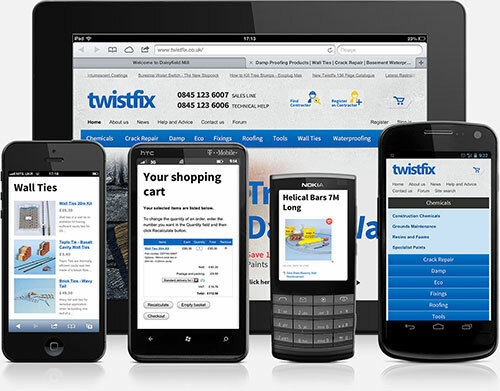 The Twistfix mobile website was an instant success and has already been used many times by customers. A sleek, modern interface is designed to reflect the company's existing branding and gives visitors complete control over their experience. The website displays perfectly on smartphones and tablets and a secure, reliable online checkout allows customers to pay for their purchases with absolute peace of mind. Of course, seeing is believing and so we invite you to browse the new Twistfix mobile website on your smartphone or tablet at www.­m.­twistfix.­co.­uk to experience its many qualities for yourself. M-commerce will continue to grow and Brickweb will continue to provide a world-class service that embraces all advances in technology. A comprehensive mobile website, expertly designed by our dedicated and experienced team, will instantly prove its worth in increased traffic, brand-awareness and ultimately in improved sales. Please enjoy browsing the fine example of Brickweb's work that is the new Twistfix mobile website - www.­twistfix.­co.­uk - and do not hesitate to contact our expert team on +44 (0)1254 277190 or email info@brickweb.co.uk for information and to book a free, no-obligation consultation on how a Brickweb mobile website can help your business achieve an impressive reputation.